In January 1944, the Allies decided to land at Anzio in order to overcome the stalemate at Cassino. This amphibious landing has become one of the most controversial campaigns of World War II (1939-1945). Questionable decisions by the Allied leadership led to three months of World War I-style trench warfare, and the entire beachhead suffered from continuous German observation and bombardment. Vividly describing each thrust and counter-thrust, this book takes us through the agonizing struggle as each side sought to retain or regain mastery. 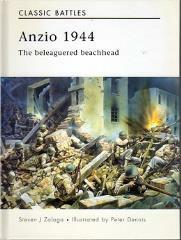 It shows how Anzio proved to be a stepping stone not only to Rome but also to the liberation of Italy.